"I have a daughter. I have the most beautiful wife in the entire world. I am one of the luckiest people who has ever lived and it has nothing to do with me. It has to do with the people who love me the most." 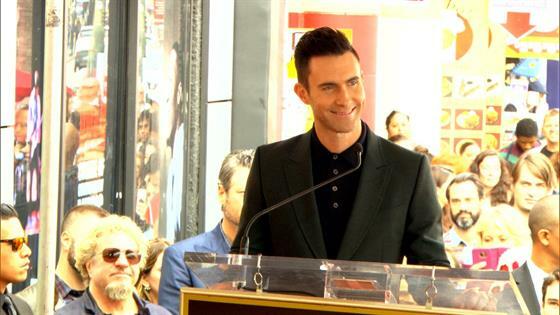 When Adam Levine said those words when accepting his star on the Hollywood Walk of Fame back in February 2017, it was a rare public proclamation of love for his family. He may be the Grammy winning frontman for Maroon 5. And his wife Behati Prinsloo may be known around the world as a highly sought after model. But despite their A-list status in their respective professions, fans may not know the whole story on how these two stars came together and created an unbreakable bond. In fact, that bond has resulted in the couple celebrating their four-year wedding anniversary today. So how did these two become a true Hollywood power couple? "We kind of started talking over e-mail, back and forth for months. I was kind of making fun of him," Behati recalled on Access Hollywood Live. "We talked over e-mail for such a long time and then went to LA and we met for the first time." "When we met finally, face to face, he was shooting the boxing music video, 'One More Night,' I think it was, so he had gloves on," she continued. "And I walked through the door and was like, 'What am I doing here?' And he had his gloves on and was like, 'This is awkward, hi!'" What may have started off on an uncertain note quickly turned into a special romance that included private dates around the world. As for the proposal, Adam went to Behati's dad for permission first. And once he got the a-okay, it was time to perform the task he once wondered if he would ever do with any woman. "Doesn't matter how certain you think you are. You still get down on that knee and…you just get woozy and you're like, 'I'm doing this. Oh my God…' I got down on that knee and everything changed immediately," Adam recalled to Kelly Ripa and Michael Strahan. "I lost my equilibrium. I had to get on the other one…Both knees. Like look, I got on both knees. And it didn't sound charming at all. She was like, 'What?'" Don't worry, she said yes and a private wedding soon followed at Flora Farms in Cabo San Lucas, Mexico. Guests including Candice Swanepoel, Coco Rocha and Jason Segel watched the 20-minute ceremony that was officiated by Jonah Hill. The newlyweds would later reportedly enjoy a honeymoon in South Africa. Throughout their four years of marriage, the couple would occasionally walk a red carpet together. On special birthdays and occasions, they would post a heartfelt note to each other on social media. And during certain interviews, we would get a sense into their love story. But ultimately, these two have chosen to keep their public relationship as private as it can be. The same goes for their two children they have welcomed in recent years. The couple welcomed Dusty Rose Levine in 2016 and Gio Grace Levine earlier this year. It's safe to say parenthood has had an affect on the couple. "I love Adam, and when you get married and you fall in love with someone, you think that there's no greater love than that love," Behati previously shared with People. "And then you have a baby, and it's just next-level love." Adam would also tell Howard Stern, "I think that as far as being a father, or being a parent, or just being a person in the world, which is extremely complicated...I feel like I've managed to figure out. Whatever life is, I'm doing it pretty well. I wake up happy." As Adam continues serving as a coach on NBC's The Voice while also creating new music and touring with Maroon 5, the musician has hopes that his family is just beginning. In fact, during a recent appearance on The Ellen DeGeneres Show, the man behind hits like "Girls Like You," "She Will Be Loved" and "Moves Like Jagger" has a number of kids in mind before all is said and done. "At this rate, I think I'm going to definitely let my wife be in control of the timing of the next child. We want, like, a lot. At least [five]," he told Ellen DeGeneres. "I want a lot [of kids], I thrive in chaos." So is Behati on the same page? We can tell you this: She loves seeing Adam as a father to their two daughters. "Our girls are so lucky to call you dad and I'm so lucky to have you as a husband a lover and a friend," she previously shared on Instagram. "We love you. Life is better with you."